Product #46826 | SKU MK190XPRO3-BHQ2 | 0.0 (no ratings yet) Thanks for your rating! The MK190XPRO3-BHQ2 Aluminium Tripod from Manfrotto pairs the MT190XPRO3 aluminium tripod legs with the MHXPRO-BHQ2 XPRO Ball Head with a 200PL quick release clamp and plate. The tripod can hold up to 7 kg, extend to 1.7 m, and weighs 2.5 kg. The legs use the Quick Power Lock System that allows you to completely extend the tripod legs with just one hand. Once set up, you can use the tripod's rapid centre column in standard vertical mode or swing it into horizontal position like a boom with Manfrotto's 90° Column feature. Enlarged tabs on the individual leg angle selectors allow you to get down to only 9 cm for macro work with the column in horizontal mode. You can attach any of Manfrotto's flexible or articulated arms to hold lights or reflectors via the Easy Link plug built into the tripod's spider. Convenience features include grippy, rubber leg grips on two legs for comfort in cold weather and a bubble level that rotates so that you can see it easily regardless of the tripod's position. 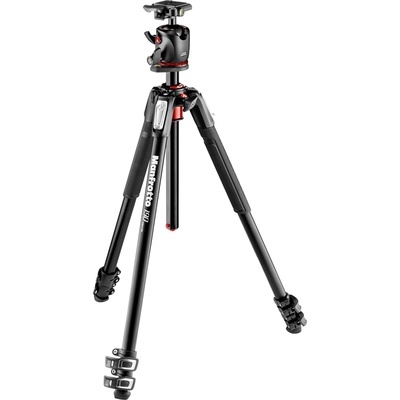 The black, redesigned MT190XPRO3 Aluminium Tripod from Manfrotto builds on the success and popularity of the previous 190 series with professional hardware and convenience features that make it even easier to use than its predecessor. Set up is faster than ever with Manfrotto's Quick Power Lock System that allows you to completely extend the tripod legs with just one hand. Once set up you can use the MT190XPRO3's rapid centre column in standard vertical mode or swing it into horizontal position like a boom with Manfrotto's 90° Column feature. Enlarged tabs on the individual leg angle selectors allow you to get down to only 9 cm for macro work with the column in horizontal mode. And once you're down there you can attach any of Manfrotto's flexible or articulated arms to hold lights or reflectors via the Easy Link plug built into the tripod's spider.